We'll learn more at Bethesda's E3 conference. Todd Howard appeared the Microsoft E3 2018 press conference to tease Fallout 76. 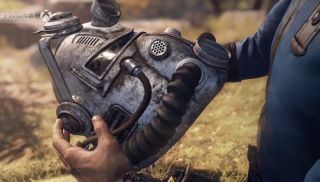 He didn't confirm whether it's a proper full-scale open world Bethesda RPG or not, but he did say that, whatever it is, it will be "four times the size of fallout 4." It's set in the hills of West Virginia, and you play as "one of the first to emerge into an untamed and very different wasteland" to previous Fallout games. It's a prequel, which might be why the world looks less brown and utterly ruined than Fallout games tend to be. We'll almost certainly learn more at the Bethesda E3 2018 conference happening later today, but the trailer showed some sumptuous vistas. The video isn't live on Bethesda or Microsoft's channels yet, here's a rip and a couple of grabs from the presentation in the meantime. Stay tuned for more Fallout 76 info later today.